What Do Privacy Laws Say About Tapping Employee Calls? Is It Legal for My Boss to Record My Phone Calls? If you call any customer service line, you're likely to hear a recorded statement explaining that your telephone call may be "monitored for quality control." This type of monitoring is the standard operating procedure for many companies, and, within certain parameters, it is perfectly legal. Which begs the question, What are the limits placed on employers' ability to tap into employee phone calls? When Is it Okay for an Employer to Listen to Employee Phone Calls or Messages? 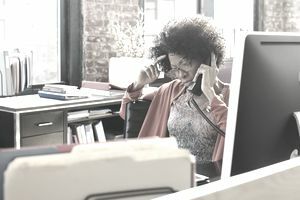 In general, it is legal for employers to monitor business-related telephone calls to and from their own premises—for example, to evaluate the quality of customer service. However, a federal law, the Electronic Communications Privacy Act, or ECPA (18 U.S.C. § § 2510 to 2720), puts some major limitations on that right. The ECPA restricts individuals and organizations, including employers, from intercepting wire, oral, or electronic communications. Under the Act, even if a call is being monitored for business reasons, which is perfectly legal, if a personal call comes in, an employer must hang up as soon as he or she realizes the call is personal. An employer may monitor a personal call only if an employee knows the particular call is being monitored—and he or she consents to it. While this seems like a fairly straightforward ruling, it may or may not cover all of your communications. For example, what happens if you make a private telephone call despite your employer's "no personal phone call" rules? According to the Privacy Rights Clearinghouse, "when employees are told not to make personal calls from specified business phones, the employee then takes the risk that calls on those phones may be monitored." What Other Types of Workplace Surveillance Is Okay? While your employer should not be listening in on your private telephone calls without your knowledge and consent, they do have other rights that are almost as invasive. For example, employers have the right to make audio and video recordings of employees (provided they are not in bathrooms or locker rooms). In some states, they have the right to listen to voicemail recorded on business phones (usually after the employee has heard the message). In addition to this type of oversight, employers are also entitled to install software that tracks your internet usage, monitors your keystrokes, and observes the number of hours during which you are actually working on work-related documents. If you are concerned about your employer tapping into your personal use of telephones, social media, or email, you're right to worry. Depending upon the type of work you do and the type of employer you work for, there's a significant chance that you're being monitored. There's also a good chance that the monitoring is legal. To avoid sharing private information with your boss, your best bet is to use your own phone and laptop and take your personal communications outside the office building.